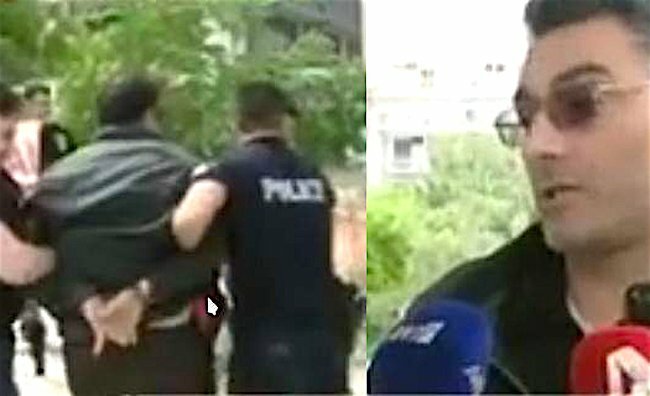 A man who was talking on television after the postponement of an Athens Court of Appeals session on Friday, pulled out a gun and started shooting in the air, before he was arrested by police. The shooter is an uncle of Marios Papageorgiou, the young man who was kidnapped for ransom and then was killed in 2012. Even though the case was solved and the kidnappers were arrested and convicted, the body of Papageorgiou was never found. The perpetrator was telling television reporters that the authorities never cared to find the body of his nephew and all of a sudden, while he was completely calm, he pulled out a handgun and shot three times in the air. Then he hugged the victim’s mother. Everyone was flabbergasted, unable to believe what had just happened. Passersby notified the police officers who were near the incident and they apprehended the shooter. On August 9, 2012, 26-year-old Marios Papageorgiou had left Diakofto where he was vacationing with his mother and headed for Aigio, his hometown. On August 10, Mario’s mother received a phone call from a stranger who said that he has her son and asked for 620,000 euros as ransom. The woman listened to the advice of a 73-year-old family friend and did not call the police. It was the man who, as it turned out, had organized the kidnapping and killed the young man. Marios’ disappearance was reported to the police on August 17. Throughout this time, the kidnappers were assuring the mother that her son was alive and that they would release him if she gave them the money they had asked. At the same time, the alleged “mastermind” of the kidnapping assured the mother that he had good connections with police agencies and that he was searching for her son, which she believed. Hellenic Police solved the case in October 2012, and a few months later, with the help of specialists and the help of TV show “Light in the Tunnel,” helped to uncover that yhe hidden blood stain in the trunk of the 26-year-old’s car was his. The 73-year-old who masterminded the kidnapping was sentenced to life plus 23 years for homicide, blackmail, forming a criminal ring and attempted extortion. His wife, who was his accomplice, was sentenced to 18 years imprisonment for kidnapping attempt and involvement in a criminal ring. The man who was making the phone calls to Papageorgiou’s mother was sentenced to six years imprisonment as an accomplice to the above crimes. The mother of the victim is trying to keep the case open in order to find her son’s body and have a proper burial service. Get Ready for ‘Greek Freak Week’ With NBA All-Star Giannis Antetokounmpo in NY!